Do You Need a Fence For Your Dog in Maryland? If you’re ready to start adopting a dog to complete your perfect home, you know you’ll have to start working on purchasing a fence. If you’re ready to start adopting a dog to complete your perfect home, you know you’ll have to start working on purchasing a fence. While a hefty investment, fences go a long way in pet ownership. It can be daunting, and the pressure to choose the right fence is often stifling. Many forgo the choice entirely, and pick an electrified invisible fence. This is considered animal abuse by many, as shocking a dog who strays from unclear boundaries isn’t a proper punishment. Read on to find a better, more efficient way of fencing in your yard for your dog. Always check with your homeowners association first. If they don’t have a limit on fence height, pick the tallest possible. 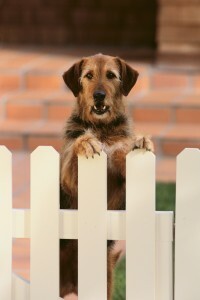 Your goal with fencing for dogs is to make sure they have as little view of outside the yard as you can. If your dog is large, you may want to consider a six-foot fence. At the very least, make sure the fence is tall enough so that your dog can’t jump over it. And be careful–some dogs are secret pole vaulters! A solid wooden fence–that is, where the pickets are so close together there are no gaps–is going to be the best. This way, children on the outside can’t poke their fingers in or feed your dog. You’ll also prevent your dog’s nose or paws from getting stuck. If you want another aesthetic option, you could choose something like a split fence or a chain-link fence. A split fence is far more pleasing to the eye. The downside is that there is a very open view of the world for your dog to see, but still very small spaces so no one gets stuck. Consider, also, how much damage may be taking place. Choose a sturdy material, sometimes even something like vinyl, so your dog can’t scratch through it and allow for water damage to the posts. Dogs like to dig. Some will work on holes under fences in places you may not normally see. Before you know it, Cujo will have escaped and your fence will have been for naught. To prevent this, make the fence go a foot or so into the ground. This just provides better prevention for escape, and may discourage your dog from digging. Need a fence installed for your dog? Mid-Atlantic Deck & Fence has you covered. Mid- Atlantic Deck and Fence has been building custom fences and decks throughout Maryland since 1987. We also offer gazebos, pergolas, pagodas, and screen porches. Today, we are one of Maryland’s leading and most innovative deck and fence companies. Click Here to request an estimate for your fence today!